.TONIGHT…Partly cloudy. Lows in the mid 60s. Northwest winds 5 to 10 mph. .THURSDAY…Partly sunny. Highs in the lower 80s. West winds 5 to 10 mph. 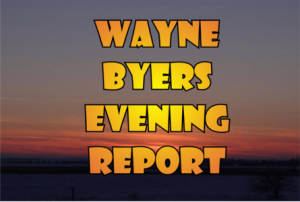 .THURSDAY NIGHT…Mostly clear. Lows in the lower 60s. West winds 5 to 10 mph. .FRIDAY NIGHT…Clear. Lows in the mid 60s. .SUNDAY…Mostly sunny. Highs in the upper 70s. Another round of isolated thunderstorms are forecast across southern North Dakota after midnight into Thursday. Severe weather is not anticipated. Isolated thunderstorms are forecast Thursday morning. Thunderstorms are forecast to remain non-severe. at another building ridge by mid-week. Jamestown (KFYR) The woman whose four-month-old son was found dead on Saturday in rural Stutsman County has been charged with manslaughter and child neglect, according to court records. 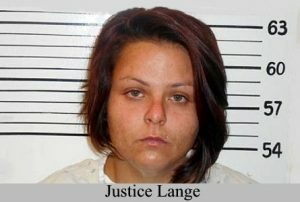 Twenty-five-year old Justice Lange had been missing for four days and told authorities she couldn’t remember the last time she had her son. She will have an initial appearance Thursday morning at 10:30 in Stutsman County. Lange is being held in Stutsman County on a parole violation. The Stutsman County Clerk of Court confirms there was oral probable cause for the charges. Stutsman County Sheriff Chad Kaiser says the autopsy report on the official cause of the baby’s death has still not been released. KLJ engineer Chad Peterson says the work includes milling the streets and placing a hot bituminous overlay, as roadway will be partially open to traffic but delays are expected. For more information on services at JRMC, visit www.jrmcnd.com or call 701-952-1050. WATFORD CITY, N.D. (AP) — Warning sirens were sounded before a tornado ravaged an RV park in a city on the North Dakota oil patch, but park residents said they didn’t hear them, authorities said Wednesday. A newborn baby was killed and more than two dozen people were injured when the storm moved through Watford City shortly after midnight Tuesday. More than 120 structures were demolished. McKenzie County Sheriff Gary Schwartzenberger said the sirens were activated but “the storm was so loud you couldn’t hear them.” He said the storm also took out a radio communications tower and forced law enforcement to use a mobile command unit. Prairie View RV park resident Clifford Bowden said he didn’t hear sirens but someone he knows who lives across town heard them. “It was pretty calm on that side of town,” Bowden said. It’s not clear how many sirens are in the city and whether they were functioning properly. Karolin Jappe, the McKenzie County emergency manager, did not immediately return phone messages left Wednesday by The Associated Press. Ken Simosko, National Weather Service meteorologist in Bismarck, said a severe thunderstorm warning with the possibility of a tornado was issued about 60 minutes in advance of the storm. Schwartzenberger said there are numerous shelters in the city, some of them within minutes of the RV park. The tornado destroyed 122 structures and damaged about 200 more, though about 120 are still habitable, Mike Nowatzki, spokesman for Gov. Doug Burgum, said Wednesday. BISMARCK, N.D. (AP) — A Denver woman accused of shooting at officers during protests in North Dakota against the Dakota Access oil pipeline is finding out how long she’ll spend in a federal prison.Red Fawn Fallis is being sentenced Wednesday afternoon in Bismarck. Prosecutors are recommending seven years in prison, though federal Judge Daniel Hovland could give her up to 15 years.Authorities accused Fallis of firing a handgun three times while resisting arrest in October 2016. No one was hurt. She pleaded guilty Jan. 22 to civil disorder and a weapons charge. Prosecutors agreed to drop another weapons charge.The months of protests drew thousands of pipeline opponents and resulted in 761 arrests, but it didn’t stop the project. The pipeline has been moving North Dakota oil to Illinois for a year. GRAND FORKS, N.D. (AP) — Officials say the first trans-Atlantic flight by a medium-altitude, long-endurance unmanned aircraft has successfully landed in England.The General Atomics Aeronautical Systems Inc. drone departed from the Grand Sky park at the Grand Forks Air Force Base Tuesday afternoon.The flight covered more than 3,000 miles before landing in Gloucestershire, England, where the Royal Air Force is holding its centennial celebration.The aircraft is an MQ-9B Predator, which is made by General Atomics Aeronautical Systems Inc., a tenant at the Grand Sky park.Thomas Swoyer Jr., president of Grand Sky Development Co., says the flight is a “critical first step” in developing a commercial network of large drones that can crisscross the United States or the world to support emergency responders, provide services in a natural disaster or deliver supplies. BISMARCK, N.D. (AP) — The North Dakota Legislature’s top attorney has been hired as the new director of the Legislature’s research agency.The bipartisan Legislative Management Committee voted unanimously Wednesday to hire John Bjornson to lead the Legislative Council. Its incumbent director, Jim Smith, is retiring in August after 39 years with the agency.The nonpartisan research arm’s 34-member staff includes accountants and attorneys who draft new laws and budget proposals for lawmakers. The agency has a two-year budget of $11.8 million.The 55-year old Bjornson is a native of Edinburg and a graduate of the University of North Dakota. He began working at the agency in 1988.The committee did not discuss his compensation. Smith is paid $191,000 annually. VALLEY CITY, N.D. (VCSUVikings.com)- The North Star Athletic Association announced Monday that 79 Valley City State University student-athletes have received the conference’s scholar-athlete award for the spring academic season. VCSU athletes from the sports of basketball, golf, track and field, softball and baseball received the NSAA Academic Scholar-Athlete honor, which recognizes success in the classroom during a student-athletes’ season of competition. To be eligible for the NSAA Academic Scholar-Athlete honor, a student-athlete must achieve a cumulative grade point average (GPA) of 3.25 on a 4.0 scale. VCSU’s 79 student-athletes receiving the honor was the second-most among all NSAA schools. They join 39 other VCSU student-athletesfrom football, volleyball and cross country that received the honor during the fall semester. BRUSSELS (AP) — President Donald Trump and first lady Melania Trump are attending a dinner for NATO leaders in Brussels. The gathering comes just minutes after Trump tweeted “what good is NATO” amid a day of grievances about the decades-old alliance. The Trumps arrived at the Art and History Museum at the Cinquantenaire and first mingled with other leaders at a cocktail reception. MATAMOROS, Mexico (AP) — Migrants attempting to cross the U.S.-Mexico border often arrive with little more than the clothes on their backs. But the few belongings they bring often include evidence intended to help them seek asylum, including audio recordings, crime-scene photos, police paperwork and even medical examiner records. Immigrant families hope these documents help demonstrate to U.S. authorities the dangers they are trying to escape back home. GUATEMALA CITY (AP) — Eleven families who had been detained and separated after they were caught crossing the U.S. border illegally returned home to Guatemala aboard a chartered flight. They lined up on the tarmac, shuffling. Their shoelaces had been taken as a security precaution. U.S. immigration officials handed over paperwork to Guatemalan officials and shook hands. The group walked single-file into a squat grey building to be processed back into their country, along with dozens of others also deported. MAE SAI, Thailand (AP) — The 12 Thai boys rescued from deep within a flooded cave have made two-finger victory signs from their hospital beds in a moving video from the isolation ward where they’re recuperating after an 18-day ordeal. The youngest, who is 11, appeared asleep under a crisp white sheet while others including their 25-year-old soccer coach sat in bed, their faces obscured by green surgical masks. Some of their parents are seen crying and waving to them from behind glass. MUNICH (AP) — A German court has found the main defendant guilty in a string of neo-Nazi killings a decade ago _ a high-profile trial that raised fresh questions about the treatment of migrants as Germany grapples with an unprecedented influx of refugees and surging support for a far-right party bent on keeping the country white. Beate Zschaepe, the only know survivor of the National Socialist Underground, was sentenced to life in prison in the killings of 10 people _ most of them migrants _ from 2000-2007.